Still using paper job applications? If you’re a retailer of any size (1 store or 500 stores) you have probably, at some point, used paper job applications for walk-in applicants. Many of you have made the shift to online applications, and have officially gone “paperless”. But it’s surprising to find, in this day and age of mobile phones and cloud computing, how many large retail organizations still use a “hard copy” approach to job applications. Upon entering a Jamba Juice location in Bellevue, Washington, I came across this great poster on their front door. It grabbed my attention, as it should, and prompted me to ask the counter people how to apply. 1. If I’m looking for an hourly position with retail establishments, there are lots to choose from (in this location alone there was Radio Shack, Panera Bread, Panda Express, Claires, and many others). I guess I’d have to really want to work specifically at Jamba Juice to take the time to go through the hassle of coming back with an application a second time. My gut feeling is that most candidates that are likely to apply at JambaJuice are used to instant gratification with their mobile phones, and the idea of printing something out and bringing it back in could push them over the edge. 2. For the Store Manager who gets the printed application, he/she will have to confirm that the online version was submitted to HR in order to be in compliance before they can hire the applicant. I’m sure the manager has enough paper work on his/her desk, and the last thing they need is a pile of applications to filter through. Clearly the candidate experience could be a lot better, and Jamba would make more of an impression for its young, progressive culture by offering mobile job applications to be completed directly from the smartphone of the applicant when they are in the store. Today I pulled into the parking lot of the soon to be opened Marshall’s at the Grand Ridge Shopping center in Issaquah, Washington. They were advertising a hiring event with big posters all over the front windows and doors. So, being the curious non-job seeker I am, I walked in to find out how they were handling walk-in applicants. 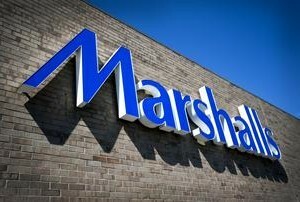 I was surprised to find that Marshall’s, which is owned by TJM, a holding company for a number of popular retail brands, had not yet made the leap to online applications – they were handing out physical paper applications for candidates to fill out. On the one hand, this is better then Jamba Juice’s approach, because I don’t have to leave, then come back with the application (I can complete it there), but on the other hand, in my mind this is a tracking nightmare for store management and corporate HR. I’m curious to know how much time/money is spent manually inputting the data from this paper application into an HR system – or perhaps in this case, Marshall’s uses the paper application as a first step, and if there is interest, they ask the candidate to complete an online application. Either way, I’m sure almost every single applicant has a smartphone with a mobile browser, and could easily be promoted to complete a mobile job application on-site directly from their phones, which could be accessed by a text message or QR code. In summary, I don’t have enough data to offer statistics around how many retail companies have made the transition to paperless job applications, but from what I’m seeing out in the field, the numbers aren’t as high as you’d think in this increasingly automated world. What has been your experience with paper vs paperless job applications?. Vivamus rhoncus eget nisi nec scelerisque. Donec iaculis magna quis turpis imperdiet, a luctus magna varius. Integer urna arcu, tempor hendrerit cursus sit amet, pulvinar a mi.